Death of a Pancreas: Diabetes Shirt Info! Through a very generous offer from my Mom's husband's sister and brother-in-law (my best friend's sister's boyfriend's brother's girlfriend heard from this guy who knows this kid who's going with the girl... name that movie quote! ), we are happy to announce that the price for the shirts will be $15... and that's including taxes and shipping! For any Canadian peeps, it will be $20. Sorry to do that to you, but it's the shipping that kills you. (S - XXL), woman's sizes (S - XL), as well as kid's (2/4 - 14/16). You will then need to send us the money for the shirts via Paypal (very easy and totally secure, I use it all the time). To send money, all you have to do is go to http://www.paypal.com/, click on send money, and enter the email address above in the "To" line. We will not be able to submit the order for printing until we have collected all the money. 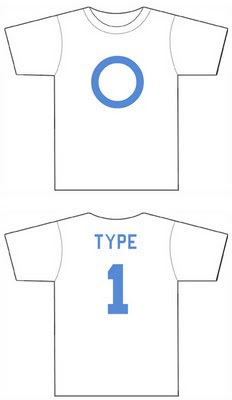 We really want to send these out in time for World Diabetes Day, so we need you to send in your order and payment ASAP. It will take about a week to get the shirts to us, and by using the flat-rate shipping boxes they should get to you in about 2 days. Now let's get the word out! Take the info and post it on your blog, or you can link to my blog, it doesn't matter, let's just show the world our BLUE! Edited to add: on the off chance there are people outside of the U.S. and Canada that would like to order a shirt, please email us and we'll see what we can figure out in terms of a price (based on where in the world you are). I can't guarantee it will get there by Nov. 14th, but at lease you'll have a cool shirt! Is it a Hugh Grant movie? I will put it out on by blog and I am in the process of putting my order together. Please thank your family for their help! It warms my soul to know that there are good people in this world, willing to lend a hand when they can. Sorry you had a hard night, I hope everything gets back to normal today! I'll give you a clue about the quote... it's a movie from the 80s. My husband guesses Ferris Bueller's Day Off...????? ding ding ding... your husband got it! One of my all time favourites, by the way! Joanne, this is great! Putting it on my blog, FB, and the CWD parents' email list in hopes of turning the world BLUE!! Thanks for getting it together - will be ordering asap. Or as Wendy said, STAT! Hey Joanne this is wonderful, sorry it has taken so long for me to get back. My husband has a shirt guy over here and I think that I can get them done for $15 Canadian for us because I would love to get all my family a shirt and $20x8 = expensive. So if I can save $5's on each shirt that would be helpful. Also if you do have a lot of orders from Canadians would it be cheaper for the Canadians if I shipped them from Canada if Chris' shirt guy can do it? We can team up and you hand the U.S. and I can do Canada? Let me know if this makes sense to you? Chris is talking to his guy today! Email me if you like this idea! hand foot mouth disease instead..it has been miserable and no time for anything else..will get on the shirt stuff over the weekend i hope..thanks joanne!